Purpose: This study aims at studying and discussing the influence of Saikosaponin D (SSD) on the autophagy level of human hepatocarcinoma cells and their molecular mechanism. This study should provide certain theoretical basis for the clinical use of SSD to treat hepatic carcinoma. Method: This study used in-vitro cell experiments to study the influence of SSD on the clone formation, apoptosis, and proliferation of hepatocarcinoma cells. An electron microscope is then used to examine the influence of SSD on the autophagosome formation in hepatocarcinoma cell, whereas a Western blot method is applied to test the expressions of p-AKT, p-AMPK, and LC3-II in hepatocarcinoma cells. 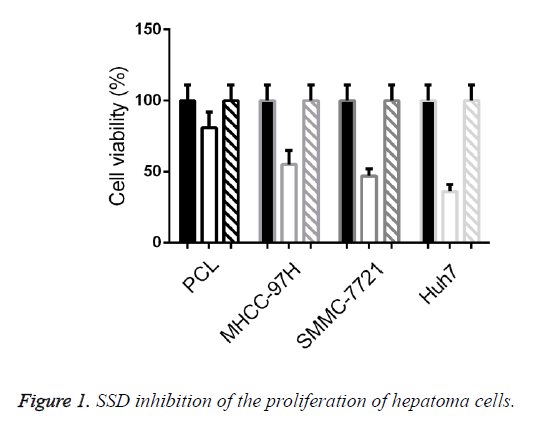 Results: After an SSD intervention for 48 h, the human hepatocarcinoma cells PLC, MHCC-97H, SMMC-7721, and Huh7 respectively decreased by 19.49 ± 2.92%, 45.41 ± 7.95%, 53.84 ± 5.53%, and 64.04 ± 4.36% compared with those of the control group. After a two-week SSD, the number of cell colonies of human hepatocarcinoma cells PLC, MHCC-97H, SMMC-7721, and Huh7 are obviously reduced when compared with those in the normal control group. The cell apoptosis in human hepatocarcinoma cells is SSD induced, and the apoptosis inductivities of PLC, MHCC-97H, SMMC-7721, and Huh7 are at 11.67 ± 1.17%, 17.54 ± 1.83%, 15.45 ± 1.55%, and 15.54 ± 1.57%, respectively. The autophagosomes in human hepatocarcinoma cells through SSD intervention obviously increased. Western blot displayed that the expression of AKT protein (p-AKT) phosphorylated after SSD processing decreased, whereas the expression of AMPK (p-AMPK) protein increased. Conclusion: SSD can increase the autophagy of human hepatocarcinoma cells, inhibit the proliferation of carcinoma cells, and promote the apoptosis of cells, which may be attributed to the AMPK/mTOR signal transduction pathway. Saikosaponin D, Hepatic carcinoma, Cell autophagy. Primary hepatoma a kind of malignant tumor seriously threatening human health; furthermore, about 10,000 people are newly diagnosed with hepatoma every year worldwide, in which most hepatoma patents are from China. The onset of the disease is insidious, and it develops rapidly; most people diagnosed with the disease are at the middle and advanced stages, and they lose the opportunity for operative treatment . Hence, finding drugs that will significantly affect the disease without causing much harm to normal tissues has become a key for the therapeutic effect on hepatic carcinoma. Cell autophagy refers to the experience of pressures such as energy shortage and external stimulus to maintain the steady state of cells, through which the organism recycles nutrient substances by degrading denatured, damaged, and aging organelles inside cells to realize the autophage need of cells and the update of organelle. On the one hand, cell autophagy facilitates cell apoptosis, and on the other hand, it promotes cell survival. Most literature believes that autophagy can inhibit the formation of tumor [2,3]. At the early stages of tumor, autophagy can limit the necrosis and inflammation in tumor to indirectly inhibit the transfer of tumor cells. Hence, studies related to cell autophagy enhances our understanding of the pathogenesis of tumor as well as assist the study of tumor diagnosis, prognosis, and treatment. In recent years, traditional Chinese medicine has shown its unique advantages in improving symptoms, enhancing life quality, and extending lifetime when treating hepatoma at middle and advanced stages. Radix bupleuri, a slightly cold with bitter and pungent taste extract found in the liver and gallbladder channels, has a long history of use in traditional Chinese medicine, and it is mainly clinically used in treating headache, qi deficiency, and other symptoms caused by the Shaoyang disease and the stagnation of liver qi . The main pharmacological component of radix bupleuri is Saikosaponin (SS), in which the pharmacological activity of Saikosaponin D (SSD) is the strongest. A large number of studies have verified that SSD has pharmacological actions on immune adjustment, anti-inflammation, liver protection, anti-virus, and anti tumor with a minor toxic and a side effect [5,6]. As a kind of traditional Chinese medicine extract with minor toxic and side effect; SSD has achieved significant results in the study on the treatment and prevention of primary hepatic carcinoma. This study aims to investigate and to discuss the influence of Saikosaponin D (SSD) on the autophagy level of human hepatoma cells, as well as its molecular mechanism, to provide certain theoretical basis for the clinical use of SSD to treat hepatic carcinoma. Human hepatoma cell lines PLC, MHCC-97H, SMMC-7721, and Huh7 were purchased from the American Type Culture Collection (ATCC). This study used the following: RPMI-1640 culture medium (US Gibco corporation); DMEM culture medium (US Gibco corporation); Foetal calf serum (Foetal Bovine Serum, FBS) (Hangzhou Sijiqing Bioengineering Co., Ltd; trypsin and EDTA (US Gibco corporation); SDD (US Sigma-Aldrich corporation); MTT (US Sigma-Aldrich corporation) CO2 cell incubator (US Forma Scientific corporation); Clean bechtop (Suzhou Cleaning Equipment Company); Ultra-pure water purifier (Beijing Liuyi instrument plant); inverted microscope (inverted microscope); -80˚C ultra-low-temperature refrigerator (Japan SANYO company). Experimental grouping: All cells are divided into three groups: control, SSD, and SSD+autophagy inhibitor 3-MA groups. No treatment was applied in the control group. The cells in SSD group were processed with 20 mM SSD for 48 h. The cells in SSD+autophagy inhibitor 3-MA group were processed with both 20 mM SSD and 10 mM 3-MA for 48 h.
Influence of SSD test with MTT method on the in-vitro proliferation of hepatoma cells: The human hepatoma cell lines PLC, MHCC-97H, SMMC-7721, and Huh7 in the logarithmic phase were taken to conduct conventional digestion, centrifugation, and re-suspending. They were prepared into single-cell suspension, which was inoculated into 96-hole cell culture plate at the density of 5 × 103 cells/hole. This was placed in a culture incubator at 37°C and 5% CO2 overnight. On the next day, the culture medium in the holes was absorbed, and a 100 μl culture medium of SSD at 20 mM was added. After the conventional culture for another 72 h, 20 μl of MTT (5 mg/ml) was added into each hole. After the conventional culture for another 4 h, the supernatant was absorbed and a 150-μl DMSO solution was added, and then, it was placed under oscillation while kept from light for 10 m. A 96-hole culture plate was placed into micro plate reader, and the absorbance value of each hole was tested at a wave length of 490 nm. Cell survival rate was calculated as follows: survival rate (%)=OD value in drug group/OD value in control group × 100%. Clone formation test: The human hepatoma cell lines PLC, MHCC-97H, SMMC-7721, and Huh7 in the logarithmic phase were taken to conduct conventional digestion, centrifugation, and re-suspending, and they were prepared into a single-cell suspension. The suspension was inoculated into a 6-hole cell culture plate according to density of 1 × 103 cells/hole and was placed in a cell incubator at 37°C and 5% CO2 overnight. In the next day, culture medium in holes was absorbed, and a 100 μl culture medium of SSD at 20 mM was added. After another two-week conventional culture, the solution was replaced every three days. The culture medium in the holes was absorbed after being fixed with 4% polyxymethylene for 15 m, and then 0.1 % crystal violet staining was implemented for 5 m. After rinsing with deionized water, a digital camera was used to photograph and to record. Quantity One (Bio-Rad) was used to quantify cell clone, and the colony forming efficiency (%)=number of colonies in drug processing group/number of colonies in the control group × 100%. FCM (flow cytometry) test of cell apoptosis: The human hepatoma cell lines PLC, MHCC-97H, SMMC-7721, and Huh7 in logarithmic phase were taken to conduct conventional digestion, centrifugation, and re-suspending, and they were prepared into single-cell suspension. The suspension was inoculated into a 6-hole cell culture plate at the density of 2 × 105 cells/hole and was placed in a cell incubator at 37°C and 5% CO2 overnight. In the next day, a culture medium containing 20 mM SSD was used to replace it. After the conventional culture for another 24 h, trypsin digestion, centrifugation, and cell collection were conducted. The cells were rinsed with PBS twice, and a 250 μl bind buffer was used to re-suspend the cells. The cell concentration was adjusted into about l × 106 cells/ml. A 100 μl cell suspension was taken, and a 5 μl Annexin V-FITC and 10 μl PI solution were added in succession. After blending, it was incubated at indoor temperature and kept from light for 15 m. Once the 400 μl PBS was added after blending, the up-flow cytometry was used for the test and analysis. Western immunoblotting of hepatoma cells p-AKT, p- AMPK, and LC3-II: Three reagents in the kit were welted and blended on ice. An appropriate cytoplasm protein was used to extract the reagent; PMSF (1:10) was added. Appropriate nuclear protein was taken to extract the reagent, and PMSF was added within 5 min before use; PBS was used to rinse cells in a 6 cm culture dish (density was about 90%) once. The EDTA solution was used for the digestion, as well as to blow and beat cells. After 12,000 rpm centrifugation and collection, the centrifugal tube was upturned for several minutes, and the cells were sedimented for extraction; a 520 μl cytoplasm protein was added with PMSF in each 52 μl cell sedimentation to extract reagent A. The reagent was placed under strenuous vibration at maximum speed for 5 s, and cell sedimentation was totally suspended and dispersed. The cell sedimentation was placed under an ice bath for 10 min; cytoplasm protein was added to extract the 26 μl reagent B. This was placed under strenuous vibration at a maximum speed of 5 s under ice bath for 1 min and centrifuged at 4°C for 5 min; the supernatant was immediately absorbed into the precooled EP tube (avoid touching sediment), and then it was named as the cytoplasm protein obtained after extraction. Samples with the same amount were mixed with 5 × sample buffer solution, which was boiled for 5 min and cooled under ice bath rapidly. A 10% lauryl sodium sulfate (SDs) was used to conduct PAGE (Polyacrylamide Gel Electrophoresis), and the separated proteins were shifted to PVDF membranes with an electric diverting method. The PVDF membranes were immersed into the confining liquid and then confined under indoor temperature for 1 h. The closed PVDF membranes were deleted each after rinsing into a small bag and an overnight incubation under 4°C. The PVDF were rinsed thrice, and the PVDF membranes were shifted into small bags containing a second antibody and were incubated under indoor temperature for 1 h. After rinsing thrice, the PVDF membranes were placed onto a plastic wrap and the appropriate ECL reagent was taken for reaction for 5 min and then placed into the gel-imaging analysis meter, and development imaging was conducted in the chemical exposure mode. TEM observation: Trypsin digested cells, 1 × 106, were collected; 2.5% glutaraldehyde was used to fix for 2 h; 4% osmium tetroxide was applied to continue fixation for 1.5 h. Dehydration was conducted with ethyl alcohol step by step; propylene oxide was used to soak it; resin was utilized for the embedding; slicer was used to cut into 600-800 nm ultrathin slices. The staining was processed according to requirements of conventional electron microscope, and TEM was used for the observation. SPSS 17.0, software of statistical analysis of data, was used. All measured data were expressed with x ± s, whereby data comparison selected χ2 test. The comparison between groups used t-test. For the variance analysis and the q IAS test, Spearman rank correlation analysis and multi-factor correlation analysis were adopted by using binary logic regression analysis. P<0:05 were regarded as statistically significant. This study used MTT methods to test influence of SSD on the proliferation of human hepatoma cell lines PLC, MHCC-97H, SMMC-7721, and Huh7. After being intervened for 48 h, the cell activities of the human hepatoma cells PLC, MHCC-97H, SMMC-7721, and Huh7 were respectively reduced by 9 ± 2.92%, 45.41 ± 7.95%, 53.84 ± 5.53%, and 64.04 ± 4.36% when compared with those in the control group; the difference is statistically significant (p<0.05). No significant difference between the SSD+3-MA and control groups in terms of cell activity (p>0.05). This indicated that SSD can significantly inhibit the activity of hepatoma cells, and this inhibiting effect was reached by inducing the autophagy of hepatoma cells as seen in Figure 1. Figure 1. SSD inhibition of the proliferation of hepatoma cells. This study further explored the influence of SSD on the clone forming ability of hepatoma cells. After SSD processing for 2 weeks, the numbers of cell colonies of human hepatoma cells PLC, MHCC-97H, SMMC-7721, and Huh7 obviously reduced by 57.11 ± 6.55%, 47.23 ± 5.15%, 51.45 ± 5.56%, and 45.45 ± 6.75%, and the difference was statistically significant (p<0.05). No significant difference between the SSD+3-MA and control groups in terms of the number of colonies (p>0.05). 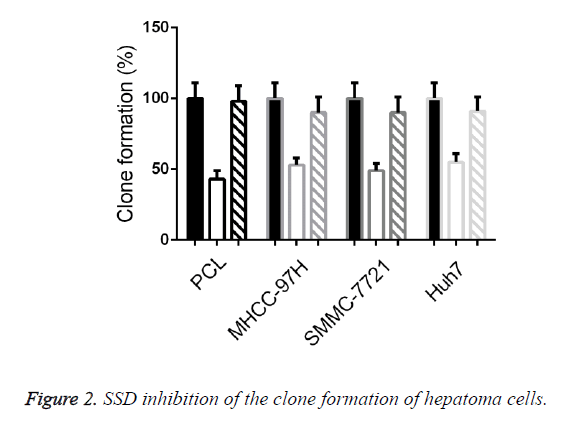 The above experimental results indicated that SSD can significantly inhibit the clone forming ability of hepatoma cells, and this inhibiting effect was reached by inducing the autophagy of hepatoma cells as seen in Figure 2. Figure 2. SSD inhibition of the clone formation of hepatoma cells. This study further tested the apoptosis status of the hepatoma cells after the SSD intervention. Cell apoptosis rates resulting from the SSD of PLC, MHCC-97H, SMMC-7721, and Huh7 were respectively 11.67 ± 1.17%, 17.54 ± 1.83%, 15.45 ± 1.55%, and 15.54 ± 1.57%, when compared with those in the control group, the difference was statistically significant (p<0.05). No significant difference was found between the SSD+3-MA and control groups in cell apoptosis rate (p>0.05). 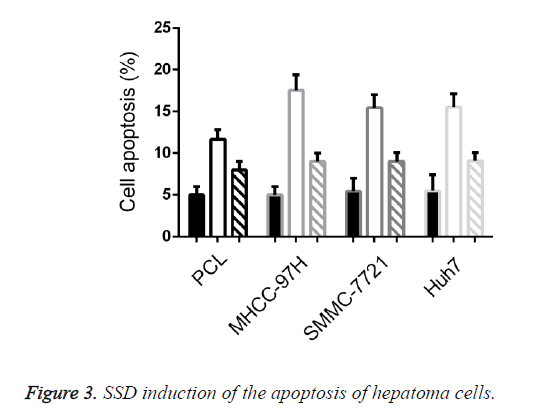 The above results indicated that SSD can induce the apoptosis of human hepatoma cells, and this inducing effect was reached by inducing the autophagy of hepatoma cells as seen in Figure 3. Figure 3. SSD induction of the apoptosis of hepatoma cells. This study further tested the influence of the SSD intervention on the autophagosome formation in hepatoma cells. Results indicated that after SSD processing, autophagosomes in PLC, MHCC-97H, SMMC-7721, and Huh7 cells increased in large quantities. However, no autophagosome appeared in the cells in the control and SSD+3-MA groups. 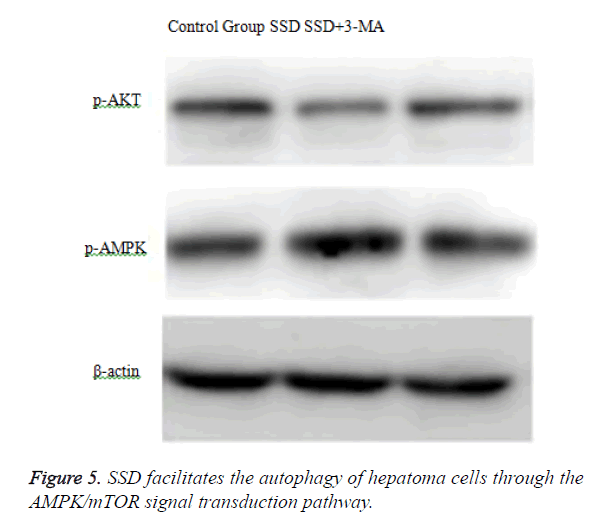 The above results indicated that SSD can induce the autophagy of human hepatoma cells as seen in Figure 4. Figure 4. SSD Induction of autophagosome formation in hepatoma Cells. (A). Control group, (B). SSD group, (C). SSD+autophagy inhibitor 3-MA group. To analyse the mechanism of SSD in promoting the autophagy of hepatoma cells, we tested the influence of SSD on the expressions of phosphorylated AKT protein (p-AKT) and AMPK protein (p-AMPK). Western blot displayed that phosphorylated AKT protein (p-AKT) failed to express after SSD processing, whereas AMPK (p-AMPK) protein expressions increased as seen in Figure 5. Figure 5. SSD facilitates the autophagy of hepatoma cells through the AMPK/mTOR signal transduction pathway. Hepatoma, with its insidious onset and its definite and delayed diagnosis in clinical pathology, is one of the most commonly seen malignant tumors in the digestive tract, occupying about 15% of malignant tumors. Furthermore, the disease has the highest death rate in malignant tumors in the digestive tract. Thus far, the standard therapeutic regimen for hepatoma is a combination of ideal cytoreductive surgery and chemotherapy which takes platinum and taxol as basis. Numerous years of exploration by clinicians have led to the application of advanced microsurgery technology in excising hepatoma tissue visible under the microscope by the largest margin; however, the survival rate among hepatoma patients after surgery stays at 15% or so. Patients that have undergone multiple chemotherapies develop some drug resistance resulting in the failure of chemotherapy as some fail to bear the strong lethal effects of chemotherapeutic drugs. Tumor and non-tumor cells are killed, and target therapy cannot be implemented. The poor prognosis among hepatoma patients has driven the discussion and search for new therapeutic drugs as a new research hotspot [7,8]. Recently, traditional Chinese medicine has shown its unique advantages in improving symptoms, enhancing life quality, and extending lifetime when treating hepatoma at middle and advanced stages. The Radix bupleuri, is a slightly cold, bitter tasting, pungent extract found in the liver and gallbladder channels, in traditional Chinese medicine has long history of use; it is mainly clinically used in treating headache and qi deficiency, as well as other symptoms caused by the Shaoyang disease and the liver qi stagnation. The main pharmacological component of the radix bupleuri is Saikosaponin (SS), in which the pharmacological activity of Saikosaponin D (SSD) is the strongest. Numerous studies have verified the immune adjustment, anti-inflammation, liver protection, anti-virus, and anti tumor pharmacological actions of SSD with minor toxic and side effect. As a kind of traditional Chinese medicine extract, SSD has achieved significant results in of the research on the prevention and treatment of primary hepatic carcinoma . This study selected human hepotaka cell lines PLC, MHCC-97H, SMMC-7721, and Huh7 as cell models of the in-vitro cell experiment, and SSD was used for the intervention. Study results displayed that cell activities after the SSD intervention for 48 h were respectively reduced by 19.49 ± 2.92%, 45.41 ± 7.95%, 53.84 ± 5.53%, and 64.04 ± 4.36% when compared with those in the control group. The difference was statistically significant (p<0.05), which verified that SSD can inhibit the in-vitro proliferation ability of these four hepatoma cells; this was quite identical with the results of other studies in the field of tumor cells [10,11]. In addition, once the cell autophagy S inhibitor 3-MA was added, the cell activity had no obvious difference with that in the control group (p>0.05), which indicated that this kind of inhibiting effect of SSD was realized by inducing the autophagy of hepatoma cells. Furthermore, this study further examined the influence of SSD on the clone forming ability of hepatoma cells. After a two-week SSD processing, the frequencies of cell colonies of human hepatoma cells PLC, MHCC-97H, SMMC-7721, and Huh7 were obviously reduced by 57.11 ± 6.55%, 47.23 ± 5.15%, 51.45 ± 5.56%, and 45.45 ± 6.75%, respectively, when compared with those in the control group, and the difference was statistically significant (P<0.05). The above experimental results indicated that SSD can significantly inhibit the clone forming ability of hepatoma cells. No significant difference was observed between the SSD+3-MA and control groups in terms of the number of colonies (p>0.05); this result indicated that the inhibiting effect was reached by inducing autophagy of hepatoma cells as seen in Figure 2. Inhibiting the proliferation of tumor cells is closely related to cell apoptosis. At present, there is still dispute over whether SSD can induce the apoptosis of tumor cells. The study of prostate cancer cells found that SSD inhibits the proliferation activity of tumor cells mainly by inducing cell apoptosis . This study adopted FCM to test the influence of SSD on the apoptosis of hepatoma cells and found that the proportion of cell apoptosis after SSD intervention obviously increased. The apoptosis rates of PLC, MHCC-97H, SMMC-7721, and Huh7 were 11.67 ± 1.17%, 17.54 ± 1.83%, 15.45 ± 1.55%, and 15.54 ± 1.57%, respectively, when compared with those in the control group; the difference was statistically significant (P<0.05). These results indicated that inducing cell apoptosis may be an important mechanism of SSD inhibiting the proliferation of hepatoma cells. SSD can induce the apoptosis of hepatoma cells, which indicated its inhibiting effect on hepatoma cells was realized through mechanism of inducing cell apoptosis. In addition, the difference between the SSD+3- MA and control groups in the cell apoptosis rates of cells was not statistically significant (p>0.05). The above results demonstrated that this effect of inducing cell apoptosis was reached by inducing the autophagy of hepatoma cells. Moreover, this study used the technical means of electron microscope to study the influence of SSD on the autophagosome of hepatoma cells. Study results indicated that autophagosomes of cells in the SSD group evidently increased when compared with those in the control and SSD+3-MA groups, which demonstrated that SSD can significantly induce the autophagy of hepatoma cells. Recent study findings have displayed that AMPK is an important kinase in cellular energy perception and cellular signal regulation during the cell autophagy process [13-15]. Literature has reported that AMPK passes serine 93 and 96 sites of phosphorylated autophagic gene Beclin1, by which it influences the activity of VPS34 (phosphoinositide-3-kinase 3) . Results of this study demonstrated that expression of p- AKT after SSD processing decreased, whereas that of p- AMPK protein increased when compared with those in the control and SSD+3-MA groups. This indicated that the induction effect of SSD on the autophagy of hepatoma cells was reached through AMPK/mTOR signal transduction pathway. In summary, the in-vitro experiment on the genesis and development process of hepatoma constantly manifested the SSD-induced autophagy of hepatoma cells and the inhibited proliferation of hepatoma cells and clone formation. Both findings were reached through the AMPK/mTOR signal transduction pathway. These results indicated that SSD has a strong clinical significance in treatment of hepatoma; as such it is expected to become a new drug for hepatoma treatment. This work was funded by the Doctoral Scientific Research Foundation of Henan University of Chinese Medicine (No. BSJJ2015-06). Pu J, Peng J, Zhu WG, Wang WW. Lapatinib-related drug utilization risk and therapeutics towards clinical esophageal cancer. Lat Am J Pharm 2015; 34: 1055-1057. Yang X, Chou G, Ji L, Han L, Zhu E. Anthraquinones from the roots of knoxia valerianoides and their anticancer activity. Lat Am J Pharm 2013; 32: 96-100. Yung BC, Li J, Zhang M. Lipid nanoparticles composed of quaternary amine-tertiary amine cationic lipid combination (QTsome) for therapeutic delivery of antimiR-21 for lung cancer. Mol Pharmaceutics 2016; 13: 653-662. Waller AP, George M, Kalyanasundaram A, Kang C, Periasamy M. GLUT12 functions as a basal and insulin-independent glucose transporter in the heart. Biochim Biophys Acta 2013; 1832: 121-127. Jadhav RL, Magdum CS. In-vivo anticancer evaluation of novel arylidene 4-piperidones analogues. Lat Am J Pharm 2013; 32: 135-138. Chen Y, Bian Y, Sun Y, Kang C, Yu S. Identification of 4-aminoquinoline core for the design of new cholinesterase inhibitors. Peer J 2016; 4: e2140. Gauthier A, Ho M. Role of sorafenib in the treatment of advanced hepatocellular carcinoma: An update. Hepatol Res 2013; 43: 147-154. Federico A, Orditura M, Cotticelli G, DE Sio I, Romano M. Safety and efficacy of sorafenib in patients with advanced hepatocellular carcinoma and child-pugh A or B cirrhosis. Oncol Lett 2015; 9: 1628-1632. Helgason GV, Holyoake TL, Ryan KM. Role of autophagy in cancer prevention, development and therapy. Essays Biochem 2013; 55: 133-151. Hönscheid P, Datta K, Muders MH. Autophagy: detection, regulation and its role in cancer and therapy response. Int J Radiat Biol 2014; 90: 628-635. Heqing Y, Bin L, Xuemei Y, Linfa L. The role and mechanism of autophagy in sorafenib targeted cancer therapy. Crit Rev Oncol Hematol 2016; 100: 137-140. Rosenfeldt MT, Ryan KM. The role of autophagy in tumour development and cancer therapy. Expert Rev Mol Med 2009; 11: e36. Lao Y, Xu N. Autophagy in Cancer Chemoprevention: Identification of Novel Autophagy Modulators with Anticancer Potential. Methods Mol Biol 2016; 1379: 151-163. Azad MB, Chen Y, Gibson SB. Regulation of autophagy by reactive oxygen species (ROS): implications for cancer progression and treatment. Antioxid Redox Signal 2009; 11: 777-790. Verschoor ML, Singh G. Ets-1 regulates intracellular glutathione levels: key target for resistant ovarian cancer. Mol Cancer 2013; 12: 138. Messner MC, Cabot MC. Cytotoxic responses to N-(4-hydroxyphenyl)retinamide in human pancreatic cancer cells. Cancer Chemoth Ph 2011; 68: 477-487.